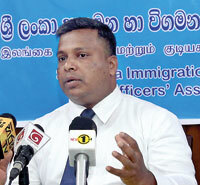 The Sri Lanka Immigration & Emigration Officers’ Association (SLIEOA) says it will decide by early next month on how to proceed with trade union action after the Government failed to provide solutions to several key demands before the expiration of deadline set by the association. The two week time period set by the union for the Government ended yesterday (December 30). The association’s main demand is the introduction of an approved service minute for the Immigration & Emigration Service. Secondary demands include posting immigration officers to the country’s embassies overseas and the re-establishment of the Departmental Prosecution Unit. The unit was disbanded in 2002 on the grounds of a staff shortage. Prosecutions relating to immigration law violations are currently being handled by the Criminal Investigation Department (CID). SLIEOA President Aruna Kanugala yesterday told the Sunday Times that they have no option but to initiate trade union action as their demands were yet to be met. He stressed that the association has been waging a silent struggle for 20 years to improve the conditions for Immigration & Emigration Officers and union action is being contemplated as a last resort. There are currently an approved cadre of 394 Immigration Officers for the Department of Immigration & Emigration. There are, however, just 10 vacancies for promotion. The majority of these positions, too, are currently vacant. Most officers have no option but to serve in the same position that they were recruited to before retiring, according to the association. Officers work under stressful conditions for long hours at a stretch. They cannot move to other Government Departments as the Immigration Service is a closed service. Under the current conditions, officers don’t get paid overtime or other allowances. “This is all because we don’t have a service minute,” Mr Kanugala emphasised. There were attempts to draft a service minute in 2002 and 2006, but they never succeeded, according to the union. The SLIEOA has now brought it to the attention of the President through subject Minister S.B. Navinna. The process of drafting a service minute this time too, has seemingly ground to a halt due to some Government bodies not giving their approval, SLIEOA President remarked. Officers are frustrated as the Government, while accepting that their demands are just, has so far failed to resolve these issues, Mr. Kanugala lamented. He reassured however, that the association would not launch an immediate strike as it would severely inconvenience the public and portray the country in a negative light internationally. As such, initial union action would likely be limited to wearing black armbands while working, and conducting awareness campaigns among the public to educate them on the issues faced by these officers. “We may also conduct protests,” the union leader added. Mr. Kanugala warned though that SLIEOA would be compelled to resort to more stringent measures if solutions continue to be delayed. The Government too accepts that the issues faced by immigration officers need to be resolved, S.B. Navinna, Minister of Internal Affairs, Wayamba Development and Cultural Affairs stressed. “But, some of these issues have been there for the past 20 years,” the Minister said, adding that attempts have been made at finding solutions during the two years he has been the subject minister. Two rounds of discussions have already been held with the President. Meanwhile, it has been decided to appoint a five-member committee under the supervision of the Prime Minister’s Secretary to study and formulate proposals regarding the issue, Minister Navinna elaborated. “We are taking steps to promote some officers to the vacancies that do exist. I don’t think there will be any problems in posting immigration officers to embassies. Drafting a service minute though, will take some time, but once it receives Cabinet approval, it too can be implemented quickly,” he stated.